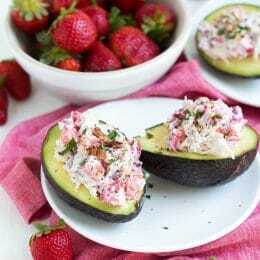 These Strawberry Pecan Chicken Salad in Avocado Bowls are perfect for spring! Spring means fresh strawberries! One of the first things I remember eating as a child was strawberries. I loved them more than anything else and always begged my parents to bring me to a local farm to pick the fresh berries. Strawberries remain my favorite food to this day and I try to incorporate them into my diet as much as possible. They are a sweet treat packed with nutrients, antioxidants and so much flavor. 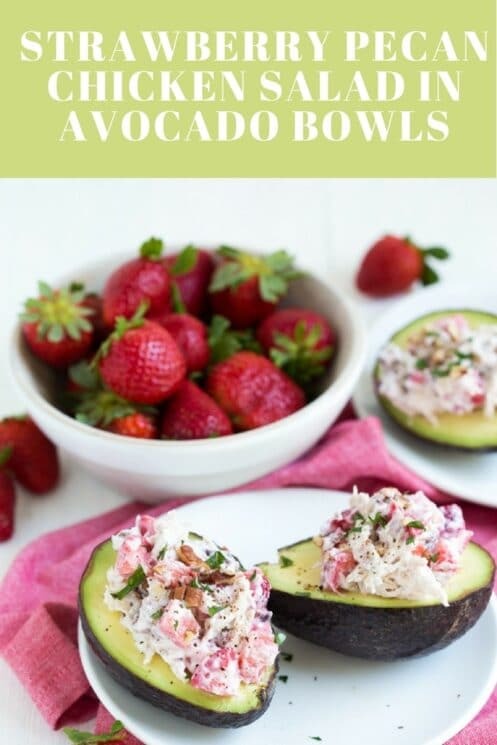 They taste great eaten whole or added to Strawberry Pecan Chicken Salad in Avocado Bowls. As a versatile berry, strawberries can be enjoyed for breakfast, lunch, dinner, dessert and snack. How do you like to enjoy fresh strawberries? Homemade chicken salad is better than anything you can buy at the store. Best of all, it’s easy too! 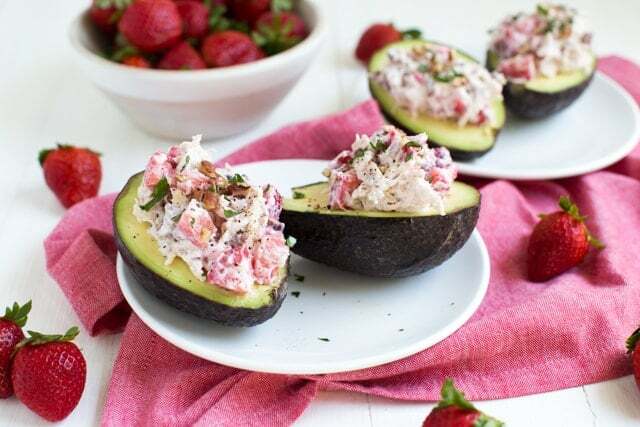 For this chicken salad recipe, I combined chicken, strawberries, pecans, paprika, Greek yogurt and a dash of salt and pepper. To add additional flavor serve the chicken salad is fresh avocado bowls. Simply scoop out a small amount of avocado flesh to make a bowl and pile the chicken salad on top. Or, if you are like me and love as much avocado as possible, you can leave all of the avocado flesh and pile the chicken salad on top. Garnish with fresh parsley and enjoy! Even the biggest chicken salad critic will love this salad. If you are looking for a lightened up dessert made with plenty of fresh strawberries, try this No Bake Strawberry Pistachio Cardamom Tart! To make this chicken salad recipe even easier use store-bought rotisserie chicken. You can prep the chicken salad in advance and store it in a sealed container until ready to serve. Ashley shares more of her favorite easy yet impressive recipes, including healthy meal plans and more, on Spoonful of Flavor. 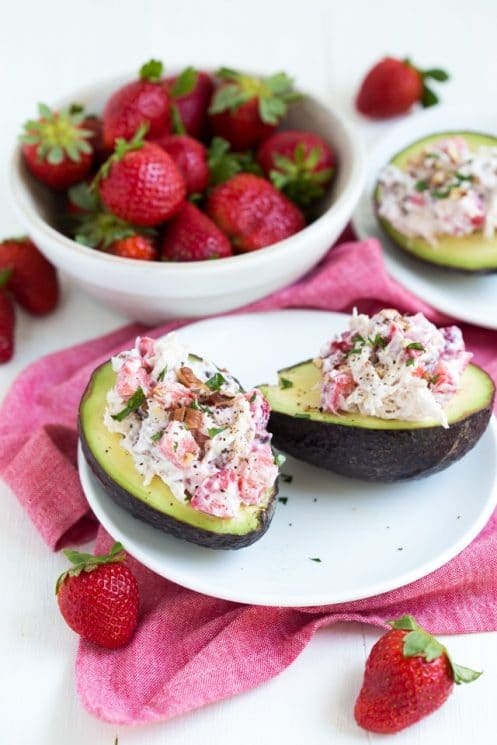 Go ahead, make this easy Strawberry Pecan Chicken Salad in Avocado Bowls and enjoy fresh berry flavor all season long! Chop or shred the chicken into small pieces. Add the chicken, strawberries, pecans, salt, pepper, paprika and yogurt to a large bowl. Toss well to combine. 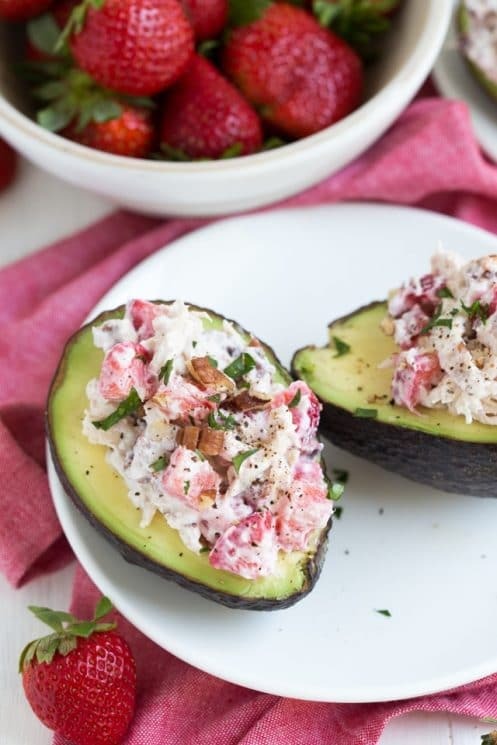 Scoop chicken salad onto pitted avocado halves. Garnish with fresh parsley and serve immediately. It has to have avocado in it to make it edible. Otherwise, it’s a NO. Neither of my daughters nor myself enjoyed this and it made quite a bit. I appreciate you sharing your recipe, but I will not even making this one again.